In an exclusive hour-long sit down with USA Today, former FBI director James Comey says that U.S. President Donald Trump is "morally unfit" to be president. WASHINGTON • If there was any chance that US President Donald Trump and former Federal Bureau of Investigation director James Comey could have avoided all-out war, it ended on Sunday night. 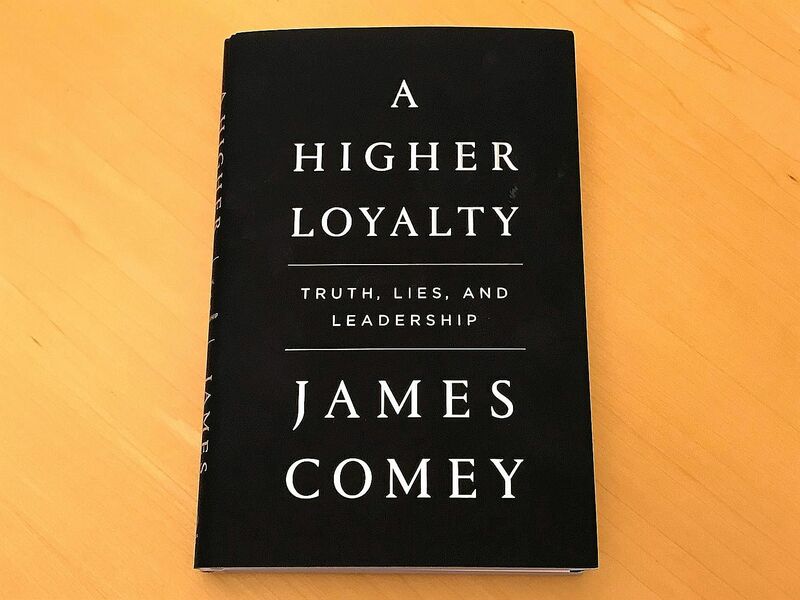 That was when ABC News aired an interview with Mr Comey, whom the President fired, as he uses the publicity blitz for his searing tell-all memoir, A Higher Loyalty, to raise the alarm about the dangers he says Mr Trump poses to the country. While ABC aired one hour of its conversation with Mr Comey, it had held a five-hour interview with him, a transcript of which was obtained by The New York Times. In it, Mr Comey called Mr Trump a serial liar who treated women like "meat", and described him as a "stain" on everyone who worked for him. He also said a salacious allegation that Mr Trump had cavorted with prostitutes in Moscow had left him vulnerable to blackmail by the Russian government. And, he asserted that the President was incinerating the country's crucial norms and traditions like a wildfire. He compared the President to a mafia boss. "Our President must embody respect and adhere to the values that are at the core of this country," Mr Comey told ABC's chief anchor George Stephanopoulos on the programme 20/20. "The most important being truth. This President is not able to do that. He is morally unfit to be President." The interview with Mr Comey and the publicity tour for his book, which is scheduled to hit bookstores today, amount to a remarkable public assault on a sitting president by someone who served at the highest levels in the government. The stakes for both men could hardly be higher. Mr Comey seems likely to be the star witness in any obstruction of justice case that might be brought against the President by Mr Robert Mueller, the special counsel in the sprawling Russia investigation. Mr Trump's legal fate, as well as his political fortunes in Washington, may depend on whether he succeeds in undermining the credibility of Mr Comey and the law enforcement institutions he views as arrayed against him. While many of Mr Trump's critics believe that the proper remedy for his perceived transgressions is impeachment, Mr Comey insisted that that would just "let the American people off the hook". He said the public was "duty bound" to vote Mr Trump out of office in the next election. "You cannot have, as President of the United States, someone who does not reflect the values that I believe Republicans treasure and Democrats treasure and independents treasure," Mr Comey said. "That is the core of this country. That's our foundation. And so impeachment, in a way, would short-circuit that." Mr Comey's intensely personal attacks - a reflection of his self-righteousness, his detractors say - are all the more combustible because they are aimed directly at a President who has said with pride on Twitter that "when someone attacks me, I always attack back... except 100x more". Firing back yesterday at Mr Comey, Mr Trump accused him of lying to Congress and exonerating Mrs Hillary Clinton in a 2016 investigation because of her strong poll numbers in the presidential race against Mr Trump. "Comey drafted the Crooked Hillary exoneration long before he talked to her... " Mr Trump fired in an early-morning tweet. Hours before the interview aired, Mr Trump called Mr Comey a "slimeball" for the second time in three days, saying in a pair of Twitter posts that the former FBI chief belonged in jail for what the President said were lies to Congress. In the ABC interview, Mr Comey had kinder things to say about Mr Trump's brainpower, saying he did not think the President suffered from mental incompetence or was in the early stages of dementia. He said Mr Trump struck him as a person of "above average intelligence". But Mr Comey responded to the President's Twitter posts with a more subtle dig of his own. "My book is about ethical leadership & draws on stories from my life & lessons I learned from others," he wrote on Twitter. "3 presidents are in my book: 2 help illustrate the values at the heart of ethical leadership; 1 serves as a counterpoint." Fired FBI director James Comey gave an in-depth interview to ABC that was broadcast on Sunday night. Here are some key quotes from his conversation with anchor George Stephanopoulos, a full transcript of which was published by the network. "Values matter. This president does not reflect the values of this country," he said of Mr Donald Trump. "A person who sees moral equivalence in Charlottesville, who talks about and treats women like they're pieces of meat, who lies constantly about matters big and small and insists the American people believe it, that person's not fit to be president of the United States, on moral grounds." "The challenge of this president is that he will stain everyone around him." Asked if the decision to reveal that the FBI was revisiting its investigation into Mrs Hillary Clinton's use of a private e-mail server was driven in part by the assumption that she would win the 2016 election, Mr Comey said: "I don't remember spelling it out, but it had to have been." "These are more words I never thought I'd utter about a president of the United States, but it's possible (the Russians have something on Trump)." Mr Comey addressed a meeting in which he briefed Mr Trump on claims that Russia had videos of him having prostitutes urinate on each other in a Moscow hotel room: "He was very defensive and started to launch into... the list of people who had accused him of touching them improperly, sexual assault and how he hadn't done this, he hadn't done that. "So what kind of marriage to what kind of man does your wife think there's only a 99 per cent chance you didn't do that?"